Today marked my last day in Amsterdam, but I wanted to enjoy the lovely weather this morning, so I started by renting a kayak at my hostel and exporting the water and the area nearby. I was afraid my camera or phone would take a swim, so I have no pictures of this lovely peaceful time, but trust me – it was gorgeous and a wonderful morning. I came back to my caravan to repack my luggage, get ready and check out. While I waited on the shuttle, I caught up on my blog posts from the past 2 days, then I boarded the shuttle ready to explore Amsterdam one last time. While I was hanging out at the hostel lobby, I did make an observation about the map of visitors. I think it tells an interesting tale. Anyone else spot what I spotted? 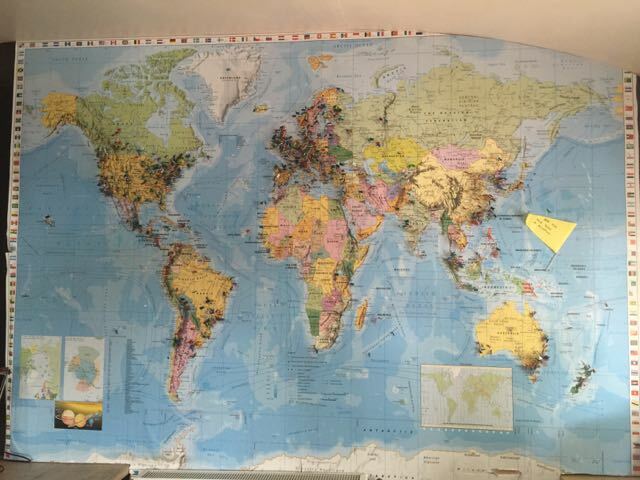 To me, this map of visitors to the hostel says quite a lot about wealth distribution, and who can afford to travel. It was a telling, interesting observation. Oh, wow! Rowing and hoeing and electronicing and training!!!!! Awesome, Merry! You certainly are experiencing a bit of everything! You are going to love Switzerland!